I have a rather small place, and space is a premium. It measures 3.1m wide, 5.5m long and the ceiling is 3m high. I also have bookshelves at one end, and a console at the other, where the speakers are sited. Until recently, I had some B&W 804D floor stander speakers, with bass that went down to 29Hz. These numbers alone should pique some interest in them, and indeed, in the right environment, they sound marvelous. But in a rather narrow room, where the actual width between the speakers can be less than 2m, and the fact that they need to be sited pretty close to the back wall does not help these towers breath. I have seen some rather large floor stander speakers used in small rooms, and often they are planted right at the corners. 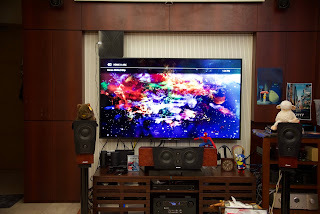 The result is not very impressive, and hardly does justice to the cost of the speakers. So with some reluctance, I know I had to get back to stand mounts, and these should have less interaction with the room boundaries. It’s been a positive experience in my own home with the C1s, sited about 70-80cm from the rear wall, about 1.8 to 2m apart. The imaging is solid, stable and has depth, with a nice projection forward too. So that got me thinking that in the typical small apartments that are common these days, should this be the rule of thumb? That if you have a small space, and aren’t ready to plaster your home with all kinds of room treatment, that it’s best to use stand mounts? When it comes to putting together an audio system, for a home theatre or a two-channel stereo, there is no avoiding a decision on loud-speakers. Speakers are an essential part of any audio system and hence spending some time getting to knows more about them is always beneficial. Today there are many types of loudspeakers including satellite, in-wall, on-wall, sub-woofer, planar, electrostatic and soon, each of which have their own specific purpose; however, one ofthe most common questions that comes up with audio enthusiastsis…“should I buy bookshelf (stand-mount / compact) loudspeakers or floorstanding (tower) loudspeakers?” Though this question may at first seem simple to answer, there is in fact much to consider in making a decision between these two primary types of loudspeakers. In our scenario, since the two speakers have similar quality and construction and use the same drivers we might guess that the floorstanding speaker would cost more. After all, the floorstanding speaker is essentially the bookshelf speaker in a taller/larger cabinet, plus it has a tweaked crossover to adjust for the greater frequency range and efficiency afforded by the larger cabinet. A larger cabinet means more material, more parts and more labour. Specifically this means more: MDF for the cabinet, adhesive for assembly, insulation, internal bracing, sanding, stain, varnish, wiring and assembly time. And, that’s not all the floorstanding speaker being larger, calls for more packaging and being larger and heavier, higher shipping/handling costs. So it would be understandable that the floorstanding speaker would have a higher cost and price but is that the whole story? Not quite - there’s something else to consider. Though the bookshelf speaker, in our scenario, should always be cheaper, the performance of a bookshelf speaker is highly dependent on the foundation that it is placed on. To realize the full performance potential of the bookshelf speaker, it must be perched atop a suitable, quality speaker stand – as opposed to….well, a bookshelf. A speaker stand, in keeping with the quality and performance potential of a book-shelf speaker should roughly cost between 20 to 35% of the price of the bookshelf speaker itself – so itis definitely a consideration. Factoring in the cost of a stand; the difference between our bookshelf speaker with a stand versus the floorstanding speaker will likely be small, if anything. This means that cost, should not be the key deciding factor between bookshelf and floorstanding loudspeakers. If you have limitations on space you might think the bookshelf speaker would be the best choice but this may not be the case. As stated above, a good quality stand is a must for getting the most out of a bookshelf speaker. A stand will likely occupy a similar amount of floor space as a floorstanding speaker and the bookshelf, on the stand, will likely be similar in height to the floorstanding loud-speaker – no space savings here. However, a bookshelf speaker can also be wall mounted or placed on a shelf – taking no floor space. Keep in mind though that wall mounting or shelf placement will most likely compromise performance. Why? A wall mount or shelf placement will put the bookshelf speaker much closer to surrounding walls than it should be for optimal performance, increasing the negative effect of rear and side wall reflections and resulting in less accurate sound with diminished bass quality. To ensure our comparison is fair, we should assume the bookshelf would be used with a stand, making the difference in size between a book-shelf and floorstanding speaker insignificant. In considering size, we did look at some placement options for a bookshelf speaker, such as wall or shelf mounting but there is more to consider in the areas of placement and décor. 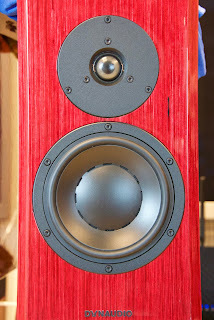 A floorstanding speaker, given its larger internal cabinet volume will generate greater bass output then a comparable bookshelf speaker. This greater bass output means the floorstander will have a greater propensity to generate standing waves within the room boundaries and excite room nodes, which could potentially compromise bass quality, specifically resulting in reduced bass definition.To compensate for this tendency, a floorstanding speaker will generally require greater attention to placement and further distance from surrounding walls than a comparable bookshelf speaker. This necessity to pull floorstanding speakers away from walls, can often present a challenge in the case of multi-use rooms. All of a sudden, the floorstanding speaker becomes a main element of décor nothing to brag about on an interior design show, for sure. This is one area that a bookshelf speaker gains significant appeal over a floorstanding speaker, since bookshelf speakers with their lower bass output can generally be placed more easily and closer to walls – where they can have less impact on décor. Another factor is that bookshelf speakers generally sit on stands that have legs, and these less are less imposing and more delicate looking, making the bookshelf and stand seem smaller than the floorstanding speaker – a plus for any stiff décor requirements. In our scenario, we are comparing a bookshelf speaker with a floorstanding speaker, where both speakers use the same tweeter and woofer and similar crossovers, with the difference between the two being limited to the enclosure/cabinet size. A larger enclosure is not a primary determinant of power handling capability (or maximum power handling) and so in our scenario, though we have two different types of speakers - the power handling capabilities, dictated by the crossover and driver will be the same. If we were not doing an apples-to-apples comparison and looking at a multi-driver floorstanding speaker, power handling would tip in favour of a floorstanding speaker but let’s keep with our scenario. Where all things, except enclosure size, are kept equal, a floorstanding speaker, given its greater internal cabinet volume, will be more efficient at producing sound than a bookshelf speaker. This greater efficiency is more commonly described in terms of sensitivity. Sensitivity is a measure of the sound pressure level (SPL) or output indecibels (dB) at a distance of 1 metre, for 1 Watt (W) of power input. A higher sensitivity rating means a higher output or louder sound for any level of power input. In short, with the same amount of power, the speaker with the higher sensitivity will produce a higher volume, at the same distance, in a room. Since our floorstanding speaker is more efficient, it will also have a greater sensitivity and therefore produce a higher volume with any given power level versus the comparable bookshelf speaker. So, if volume or amplifier power is a concern, it’s worth knowing that a floorstanding speaker will have an advantage over a bookshelf speaker. How much of an advantage is more difficult to determine, as other factors such as the specific difference insensitivity, the room size and the power available from the amplifier must be considered. One of the definite advantages that a floorstanding speaker will have over a bookshelf speaker is in the area of low frequency bass extension. It’s a matter of physics – a greater internal cabinet volume will provide greater capability for low frequency extension. So the floorstander in our scenario will be able to produce lower bass notes, at a higher volume level, than the bookshelf speaker. The question is how much lower and how much more bass? Well, that depends on how much bigger the floorstanding speaker is and also on the design of the cabinet but rest assured to some degree, whether smaller or greater, the floorstanding speaker will be able to produce a greater quantity and lower frequencies of bass. Adding a subwoofer to a pair of book-shelf speakers will more than offset any difference in bass extension but our level playing field would be gone. This brings us to a very important aspect, which is accuracy and imaging. There are a number of factors involved here that we need to consider. The first factor is that of cabinet resonance. With the movement of the tweeter and woofer, the speaker cabinet, to which the drivers are affixed, will vibrate or resonate. Cabinet resonance is an undesirable result of the movement of the speaker drivers. These resonances negatively impact the accuracy or purity of the sound waves emitted by the speaker drivers with an audible effect. The manifestation of these unwanted resonances is typically a blurring or muddiness of the sound, with reduced clarity and transient speed as well as vagueness/loss of imaging. Imaging is the ability of a stereo pair of speakers to present sounds in perceived fixed locations before the listener - left to right, closer and farther, as well as higher and lower. Good imaging, commonly referred to as the soundstage, can recreate the various elements of the sound, such as the singer or instruments, as if they were in front of the listener. Speaker engineers try to design speaker cabinets to minimize resonances and their negative effects; however, all speaker cabinets resonate to some degree. The fact is that the larger the cabinet and the longer the cabinet walls the more difficult it is to reduce cabinet resonance. Floorstanding speakers require additional internal bracing to keep their resonances in check, given their larger and longer panels. However, without great additional cost, it is very difficult to reduce a floor standing speaker’s cabinet resonances to the level of a bookshelf speaker. This means, that in our scenario, the bookshelf speaker will have lower cabinet resonance and therefore, better or more accurate, clearer sound with better imaging than the floorstander. The next factor is baffle interaction. The baffle is the front facing panel of the speaker to which the drivers are generally mounted. When the speaker drivers move and emit sound, some of the sound waves travel across the baffle before rolling around the speaker to the back. A larger baffle will have a greater impact on the emitted sound, which can be compensated for in part by the cross-over design but ultimately, larger baffles generally result in larger negative impacts on frequency response, while also reducing the ability of the speaker to go unnoticed or disappear within the sound-stage. Hence, a floorstanding speaker, having a larger front baffle, will be more negatively impacted by this effect and a bookshelf speaker will generally have a more even frequency response with better imaging. Another factor is floor bounce. Since the speakers we are considering are both two-way, two-driver models, floor bounce will generally not be a significant factor. Floor bounce is the reflection of the sound waves emitted by the drivers off the floor between the speaker and the listener. The closer the speaker drivers are to the floor, the more detrimental the impact, which generally presents itself as a hump in frequency response between 100 Hz and 200Hz. In a two way speaker, the drivers would likely be significantly elevated, minimizing this effect. This would be something to pay more attention to in a multidriver floorstanding speaker that has drivers close to the floor, in which case thebookshelf speaker would generally be more immune to this distortion. Something to keep in mind is that as you add drivers to a speaker it generally requires a more complex crossover. Crossovers have a detrimental effect on the audio signal, which can be minimized by design, parts and engineering but never completely eliminated. More complex crossovers will have greater potential to negatively impact the audio signal and most often floorstanding speakers will have more drivers and more complex crossovers than book-shelf speakers. This is not an absolute and doesn’t relate to our scenario but is worth keeping in mind. So what’s the verdict? In our controlled scenario, the results are that: cost, size and power handling are irrelevant; placement & décor and accuracy & imaging favour the bookshelf speaker and; sensitivity & volume, together with, bass extension favour the floorstanding speaker. In most general terms, this means if bass and higher volume capability are of prime importance, a floorstanding speaker will have the advantage; whereas, if accuracy, imaging and flexibility of placement turn your key, then a book-shelf speaker will likely be the more attractive choice. In the real world things get more complicated with varying quality, materials, driver types and multiple drivers, along with subwoofers. This information can help as a guide but the only way to get to a definite answer is to try as many speakers out in your room as you can and let your ears guide you.